In three informational workshops, Jennifer Ford Berry will teach participants how to enhance their everyday life by organizing both their physical world and their soul. 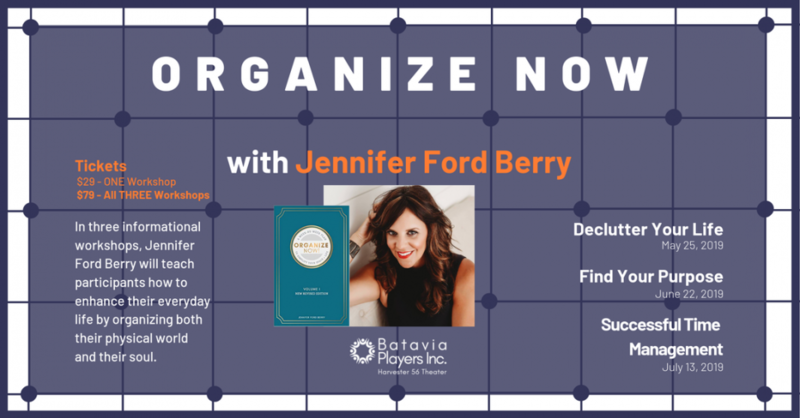 Jennifer Ford Berry is an organizational expert, best-selling author, host of the 29 Minute Mom podcast, national speaker, and promoter of God's plan. Jennifer was previously the regular organizing expert on the TV Show Winging It, Buffalo Style. Jennifer has been a guest on numerous radio and television shows. She has also been featured in many national magazines and newspapers. She is an animated speaker who has presented to the Learning Annex, corporations, churches, national conferences, mom groups, and school districts. Jennifer is a graduate of Florida Atlantic University in Boca Raton, FL. She currently resides in Western New York where she continues to work hands-on with her clients, helping them to eliminate clutter and live their dreams.